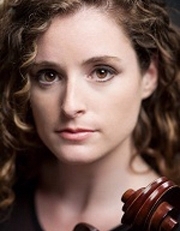 Israeli cellist Amit Even-Tov conducted her bachelor’s studies at the New England Conservatory under the guidance of Paul Katz and Laurence Lesser; she also had additional studies with Walter Levin (violinist of the famed former CCM quartet-in-residence The LaSalle Quartet) as well as Miriam Fried and Itzhak Perlman. Even-Tov has earned a great deal of success as a soloist. In competition, she has won first prize in international competitions including Israel’s Ben-Haim Competition and the special Jerusalem Academy Competition; in addition, she received 3rd prize in a national competition held by Kol Ha Musica radio (a national classical radio station based out of Jerusalem). Her long list of guest appearances as soloist and chamber musician include performances at the Verbier Festival (Switzerland), Great Lakes Chamber Festival (Southfield, Mich.), Ravinia Festival (Highland Park, Ill.) and the Yellow Barn Music Festival (Putney, Vt.). As a member of the Ariel String Quartet (CCM String Quartet-in-Reisdence since 2012), Even-Tov has shared in winning the Cleveland Quartet Award, Grand Prize at the Fischoff National Chamber Music Competition (South Bend, Ind. ), First Prize International at the “Franz Schubert and the Music of Modernity” Competition (Graz, Austria) and 3rd prize at the Banff International String Quartet Competition (Banff, Alberta, Canada). (The group also received the Székely Prize at the Banff Competition for Bartók performance.) She has been honored to share the stage with notable performers including Menahem Pressler, Alisa Weilerstein, David Krakauer, the American String Quartet and the Jerusalem String Quartet. During their stay at CCM, they have had the honor of giving a complete performance of all of Beethoven's string quartets (dubbed "The Cycle") in early 2014. Even-Tov and the other members of the Quartet are touring and concertizing extensively in North and South America, Canada, Europe, Israel and Asia; these travels have included multiple appearances in New York’s Carnegie Hall, 92nd Street Y and Alice Tully Hall at Lincoln Center, as well as other prestigious American and international locations including The Kennedy Center for Performing Arts (Washington, D.C.), Kaisersaal (Frankfurt, Germany) and others. BM, New England Conservatory, Boston, Mass. (NEC Professional String Studies Program).